If you smell a sour odor in your bathroom, the solution may be above you. Bathroom ceilings are, likely, the first place your home that will develop mold. Few people notice and act on the mold immediately, which gives it the opportunity to spread to your tiles and grout. By the time you notice it, black mold will look awful, and it may even pose health risks. What do you do when you find it, and is it dangerous? Mold spores are always around, especially in homes, on surfaces and in the air. These spores simply take advantage of any opportunities they find to grow. Most bathrooms have ideal conditions for mold growth, especially on the ceiling where moisture tends to gather and where few people clean. Usual green and white mold may have no effect on you. Or, they may cause coughs and wheezing, and exasperate asthma, allergies, and chronic obstructive pulmonary disorder. Those who have significantly suppressed immune systems may be infected by a mold directly. New research has found that young children who are exposed to mold may be more likely to develop asthma. 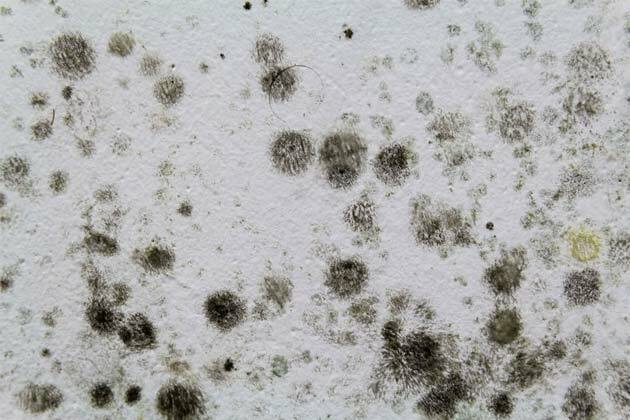 However, black mold may carry more significant risks, if it is a species of stachybotrys, a toxigenic mold. According to the CDC, toxigenic molds are not, themselves, toxic. Instead, they produce toxins that may have negative health effects. It’s rare, but possible, that the toxins stachyobotrys produces may cause serious health conditions, including bleeding in your lungs, or memory loss. Researchers aren’t sure of the relationship between toxigenic molds and these serious health problems, and many studies are being conducted to figure out just what impact mold might have on people in general. In the meantime, you should clean up mold that grows in your home. If you have very dark green or black mold on your bathroom ceiling, professional mold management is necessary. The ceiling drywall and the tile grout will be infected with mold spores and will still look unsightly after you kill the mold with a disinfectant or an acid. The best long-term solution is to remove the infected drywall or grout and replace it. Tile is generally a less porous material and can usually be salvaged. After your existing bathroom mold problem has been fixed, how do you prevent future mold issues? Remember that while you should handle all mold promptly, health effects from mold exposure is very rare. There’s no need to panic. Plus, simply reducing your humidity and increasing air circulation is usually enough to keep mold from returning. If you do have a recurring mold issue, however, be sure to call a mold removal specialist. At TSC Restoration, we offer mold remediation throughout San Diego, and we’re always just a phone call away. This entry was posted in How to Guides, Mold, Safety on November 23, 2018 by TSC Restoration.